Click here to learn more about our courses in Warrington, Chester, Crewe, Macclesfield, and across Cheshire. Click here for information on our courses throughout Derbyshire, including Buxton, Chesterfield, Derby, and more. Learn more about our courses in Hull, Bridlington, Goole, and across East Yorkshire. From Colchester to Chelmsford and Southend to Saffron Walden, we’ve got driving courses for all learners in Essex. Learn more here. No matter where you live in the capital, you're covered. Click here for information on the driving courses we offer in Greater London. Learn more about our courses in Manchester, Salford, Stockport, Bolton, and across Greater Manchester. 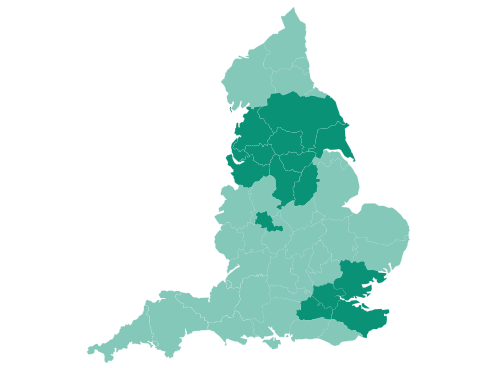 Planning on learning to drive in the Garden of England? Click here for information on the driving courses we offer in areas across Kent. Learn more about our courses in Blackpool, Blackburn, Lancaster, Preston, and across Lancashire. Click here to learn more about our courses in Liverpool, St Helens, Southport, and across Merseyside. Learn more about our courses in York, Middlesbrough, Scarborough, and across North Yorkshire. Click here for details on our driving courses in Nottingham, Mansfield, Newark, and throughout Nottinghamshire. Learn more about our courses in Sheffield, Doncaster, Barnsley, and across South Yorkshire. Learn more about our intensive and semi-intensive driving courses in Surrey, including Epsom, Guildford, Reigate, Weybridge, Woking and many more. Find out more about our driving courses in the West Midlands, including Birmingham, Coventry, Wolverhampton, and more. Learn more about our courses in Leeds, Bradford, Wakefield, Huddersfield, and across West Yorkshire.